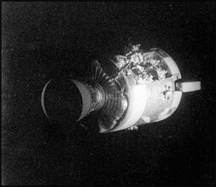 A view of the Apollo 13 Service Module, just after it was jettisoned in preparation prior to re-entry of the Command Module on 17 April, 1970. The unit was severely damaged by an explosion in one of its oxygen tanks. This mission is perhaps one of history's most famous successful failures. A successful failure is a failure that nevertheless advances the program of which it is a part. The ability to reframe failures as successful is a powerful tool for maintaining the emotional stance required for injecting oneself into situations that have uncertain outcomes. Photo courtesy U.S. National Aeronautics and Space Administration. Last time, we examined the basics of distinguishing valuable political opportunities from riskier ventures. Since most people do eventually master the basics, advantage lies in mastering the finer points. Here are some of the less-often-recognized attributes of true political opportunities. Even if pursuing the opportunity doesn't succeed, the next most likely outcome leaves you in a good position. This situation is often called successful failure. That "second prize" position might offer a variety of advantages: it might open a path to further opportunities, it might enhance your image, or it might enrich or create valuable relationships. Opportunities that you learn about through private sources are usually more valuable. If your information about the opportunity is widely available, then in all likelihood, the opportunity is nothing special. If, on the other hand, the opportunity is something special, but it's being widely advertised internally, then the chances are good that it's "wired" for someone who learned of it long before you did. I know that sounds cynical, but that's the way it often works. It's a plus if the person who first alerts you to the opportunity has nothing to gain from your seizing it. If your source does have something to gain, it's possible that the information you received is slightly tilted; not necessarily by intention, but usually with the goal of biasing your choice in a direction that benefits your source most. That might be good or bad for you, but be aware of these effects. When news of the opportunity reaches you through public channels, it's believable, though it might not be worth much since everyone has it. When the news reaches you through private channels, it could be more valuable, but it might not be valid. Seek confirmation discretely. If you pursue the opportunity, and you secure it, you then have a chance to perform. If the outcome of that performance is success, you'll benefit. But if the end result is anything less, and you still are not harmed, the opportunity is clearly more valuable, because it presents little risk. This advantage applies if you're operating in a toxic political environment, and only then. In a toxic environment, dividing your political opponents is advantageous. If merely pursuing the opportunity divides your opponents, that helps your cause. Securing the opportunity is usually even more helpful. But consider this: do you really want to remain in such an environment? Probably not. Would you like to see your comments posted here? rbrenywqgoZfJadXBjuRSner@ChaczaaVxOBzoxnOOsRyoCanyon.comSend me your comments by email, or by Web form. I offer email and telephone coaching at both corporate and individual rates. Contact Rick for details at rbrenxdrNpERYNHLEMsyQner@ChacSlhiWalHYJRKKRvooCanyon.com or (650) 787-6475, or toll-free in the continental US at (866) 378-5470.